This is an important part of this guide. Based on the information you've read in the previous parts of the guide, I'm going to assume you made the decision to create a mechanized army. Mechanized lists have a good chance at winning in 8th Edition, so we're going to start our exercise there. This doesn't mean you cannot win utilizing other archetypes, but mechanization provides the easiest learning curve and still maintains relative competitiveness. Additionally, I'm of the opinion that the best way to start an army is to plan ahead. Building a list before you start the army will give you an idea of what you want to purchase. This will save you from making unnecessary buys, especially of units that you'll never use. Plus, you can start to visualize the army once its on paper and run through how you want to play it in your head while you're building the army up. This page is designed to walk through building a list from scratch. The list will feature all the necessary elements to be successful, but that doesn't mean the list will be an end-all, beat-all army. The end result of this article is NOT a competitive tournament list. It will win more than it loses, but will fall against tournament-tuned lists. It is a casual, semi-competitive list. In addition, you don't have to run this specific army to be successful; it is simply an exercise in proper list building skills. My army does not need to be your army. It is simply a guideline for you to use. If you want to see the lists that I run, you can find them on my Army List page. Each list there contains analysis and basic use information. Each army takes practice to learn and use efficiently. Expect to lose some games after you design your army, but have faith. You'll get there. If you are more interested in competitive tournament lists or want to see more list building exercises, I recommend you visit the BT 101: Building a Competitive 8th Edition List page. As I mentioned earlier, this list will be mechanized. Not only that, it will be built up to 2000 points, as that is one of the most commonly used point values for games. Many people prefer smaller games, but I don't believe that Warhammer 40k is very balanced until 1750-2000 points. Several armies are extremely powerful at lower points levels and other armies scale much better at higher points costs. There are many examples of this: Dark Eldar are extremely effective at low points levels but Space Marines have a difficult time putting forth a decent army. It doesn't mean any army is bad at low points level, but the game balances itself out better at 2000 points. With that in mind, we move onto the list. 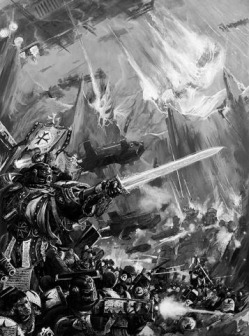 Most new players get into the Black Templars because they pick up the Space Marine codex and see that the BT seem to be the most close combat oriented of the group. Perhaps this is prompted by the background information, perhaps its the rules, or even the pictures in the codex. They often get visions of grandeur and over-estimate the effect of close combat on the game. Then those players proceed to buy the codex, an army, but have likely purchased things that aren't too good. Or they have built their dream close combat army and have found they can't win with it. Why is that? Often its because these new players build lists that lack balance, or in the case of 8th Edition, they have all these close combat units that can't kill vehicles, large characters/creatures, or large groups of enemy infantry fast enough. With exception to very specific armies (i.e. Tyranids and Tau), people don't leave their infantry just laying around waiting to be charged unless they want you to charge that unit. You have to have a way to get at those units in transports, as well as a way to effectively eliminate large quantities of infantry. The fact is, this edition of Warhammer 40,000 is designed with shooting being the most effective way to win games. Most lists need a healthy fire support contingent to compliment any assault-oriented units in your army. That's where our balanced list comes in. Having duality in your lists is essential. If you don't know what this term means, quickly go over to my article regarding it on the BT 101: Duality page. Once you're finished reading that, continue on here. This article will be written with the assumption you understand duality and units will generally be built with it in mind. Because close combat orientation is why most people choose Black Templars, this is the theme we're going to use for our list. I must mention, however, that BT need not always play this way. We can play several varieties of shooty armies quite well. In fact, I would argue that gunline armies are one of the ways the Black Templars perform best on the battlefield. But that is besides the point, let's get back to our close combat list shall we? Lets assume you've taken a look at the codex and have a basic understanding of the units inside of it. List building starts with the selection of your detachment. We'll start with the basic Battalion detachment, as it gives you the most diversity, with the least restrictions. You see that we have to take two HQ units and three troop squads. Because you want to be mechanized, those troop squads need transports. For now, we'll give them Rhinos. They will also be taking plasmaguns and power weapons. In Crusader squads, I like a little bit of internal weapon diversity, so I usually take the power axe on the Sword Brother (due to his increased attack count) and a power sword for an Initiate for the increased AP. These are taken so that our crusader squads have the ability to kill vehicles via shooting and close combat, as well as some nice close combat hitting power. You have a couple of options here: smaller, but more numerous Crusader squads, or larger, but higher quality. The destruction of your smaller squads won't hurt you much, as they are less costly points-wise, provided you took several units of them. However, we need to focus on redundancy with our units, so its going to be one or the other. Or we could go another way with a totally different troop unit, but due to our desire to field a close combat oriented list, we'll stick with the Crusaders. We're going to go for the larger Crusader squad, filling out our Rhinos capacity. This will better our chances at successfully winning our assaults. We need two HQ's and a captain is a very good baseline HQ. He provides an aura reroll to all 1's rolled to hit, whether shooting or in close combat. We get a free relic, so there is no point not taking The Crusader's Helm to increase that aura range. I like to take power axes on characters, as if you math it out, they perform the best against a wider variety of opponents but are slightly more expensive than power swords. The storm shield will give him a little bit more durability over his internal 4+ invulnerable save. We'll also take the special character The Emperor's Champion to bolster our damage output for one of the other crusader squads. Since we are adding our HQ units to our Crusader squads, we need to reduce the squad sizes on two of those units by one so we can fit those characters in the Rhinos. Not a bad start, and has us sitting slightly over 800 points. We've got some points to play around with, so why not add some more stuff that kills. Assault terminators are one of the best close combat units in the game, so they should do nicely. We'll take a squad of 5 with 2x Pairs of Lightning Claws, 3x Thunder Hammers/Storm Shields. They will act as the list's primary close combat unit and we'll utilize them aggressively in our games. We take a higher proportion of TH/SS because of the added protection from the SS, as well as the high strength kill power of the TH. The 2 terminators with LC will be more than enough to chew through most infantry anyway. They don't need to have a transport for protection due to their ability to deep strike, but its a good idea, so they'll take a Land Raider Crusader. The LRC itself is a beast on its own accord. If you arm it with the multi-melta, it becomes a monstrous fire support platform on top of its transporting duties. These will draw lots of fire in games, but will certainly kill anything they charge. Just remember that vehicles can charge and be charged in close combat, so make sure you are careful and do not put yourself in a position to lose this vehicle to pointless assaults for the rest of the game. Since we have a LRC, we might as well use more of the transport capability to get the most out of it right? Add in another couple terminators. Hmmm. That only comes to 1817 points. That still leaves us a little room to maneuver. We should have enough in the way of troops for objective capturing, though ideally you want more. Such is the cost for bulking out your units. So we have a decent amount of close combat goodness, as well as excellent anti-infantry capabilities. We're still a bit lacking in anti-tank firepower, particularly in the "First Turn Firepower" department. We have a couple open slots in the heavy support slot, so this is the best place to find this need. How about the Predator for some high power, long range firepower? This will help enable us to disable enemy firepower the first turn. Anything that harms our rhinos or LRC needs to die as soon as possible, and the first turn is ideal. Predator: 1 predator autocannon and 2 lascannons. Oops, we went over our 2000 point limit by 82 points! That is a problem, as we need our AT firepower and need our crusader squads. What can we do to fix this issue? Looking at the list, the Redemptor Dreadnought don't really fit our army style very well. Sure it charges forward blasting away and will likely draw lots of enemy fire away from other elements of our list, but they are not very redundant for an expensive unit. Plus, it has to walk a good distance to get into close combat, where its higher damage close combat can be used. We'll just have to rely on our terminators and crusader squads for our anti-infantry roles. Out the Redemptor Dreadnought goes. We can always take something like Thunderfire Cannons to fill AI needs. Why not, we'll try out a couple. That puts us over the heavy support maximum of three, so we'll take out the predator. Huh. Then we don't have our FTF platform anymore! Fortunately, there are other options in the elites slot that can arm themselves with those types of weapons. The most noticeable is the basic dreadnought. We'll give him some long range weaponry. Ack! We are still over points and all we did was adjust the units. But alas! I see the problem. We need to bring our terminator count back down to 5. 1998 points. Perfect! Or is it? You think it is, so you take it to your local tournament to play! Ack! We still lost! But what happened? We did everything right didn't we? Not quite. Our above list is certainly balanced, but it is not optimized for competitive play. It is where most newer BT players would stop in the list building process, but we will do no such thing! We are trying to go with a close combat oriented army but I think we've lost sight of that in the quest of building a balanced list. So we'll go back to the drawing board. Pulling out the codex (or Army Builder) again, we need to find ways to keep decent amounts of AT fire into the list while providing our army with our desired close combat prowess. There are several problems with our list as it currently stands. We have decent AT firepower, but they are on units that are quite expensive and frankly, easily neutralized in their current form. Attack Bikes are nice, but are easily killed with shooting. At 128 points, that is a big problem. They are very mobile, but I think these need to be changed for something else. There is also a problem with our Dreadnought. It doesn't fill a duality role and that is important in our games. It is also expensive and will be targeted early due to it being the only long range firepower we have, especially since its by itself. We also have a few opportunities with our crusader squads. In our tournament games, we put our characters with the Crusader squads so they weren't walking on the ground. This made a couple of those units a bit stronger in close combat than they would have been without. But I think we have a few inefficiencies that we can address with our unit composition to net some extra points. In addition, we can play around with our HQ's a little bit to feed into our goal of being excellent close combat units. The heavy hitting squad of terminators also rode in our LRC as planned, but that made our Land Raider Crusader a huge target and it never got across the board to unload its squad. With such a massively expensive squad, you need to ensure it is as unimportant looking as possible. Failing that, give your opponent other targets that are dangerous to him or her. The LRC is the biggest problem here, I think. But I know that we have to be open to the idea we might need to go another route with our dedicated close combat units to ensure that we are not taking huge liabilities into our games. Taking these ideas into consideration, we start playing around with our list again. We're going to take out the Attack Bikes, Land Raider Crusader, and the Dreadnought to start. That gives us 738 points to mess around with. We need some mechanized firepower to fill the attack bike void. Predators are excellent firepower platforms if armed correctly, so we'll grab three of them so we fulfill our need for redundancy. It will also give access to our Kill Shot stratagem. With duality in mind, we'll take the predator autocannon and heavy bolter sponsons. Armed in this fashion, they will excel against a wide variety of targets. We're losing 4 MM from the Attack Bikes, but we save quite a few points and fulfill duality better than before. Plus, they aren't as likely to be hurt by small arms fire (i.e. lasguns) and have far more wounds. An acceptable trade-off. This pushes the heavy support slot over 3 though, but I am not satisfied with the Thunderfire Cannons either. Its just not enough AI firepower for their points, so they go too. We're at 1470 points. Ironically, we removed our Dreadnought. However, the list needs more long range firepower. If you remember, we took it out due to duality and redundancy requirements not being fulfilled. We can fix that problem though by taking multiples and adjusting the weaponry. Unlike the lascannon and missile launcher, which is best against high toughness/wound units, we can take the twin autocannons for both arms. This weapon puts out more shots, at the cost of some strength and AP, but still doing a reasonable 2 damage. If we upgrade to Venerable, its statline will also not be affected by "damage" and can potentially shrug off wounds. We'll take two. That puts us back up to 1782 points. We still need to address the hole that the Thunderfire Cannons filled. Fortunately, with the Chapter Approved 2017 book, we saw some point decreases for some primaris units. One of the most important ones came to the Inceptor squads. Now clocking in at 135 points with their basic weaponry, they are much more reasonable and put out a ton of firepower for a compact unit. 18 str 5 shots is nothing to sneeze at, especially when they can deep strike where you most need them. But we need to make sure that we are fulfilling that redundancy need, so there needs to be at least two squads in our list. Unfortunately, that puts us over the limit quite a bit. Hmmm. What to take out? As I mentioned some time ago, I didn't believe our HQ's to be the most efficient choice for what we are trying to accomplish with the list. So to maximize our aura abilities, while feeding into our theme, I am going to take two Chaplains with minimal weaponry. Of course one of them will have The Crusader's Helm to increase that bubble, but that will be it for extra fluff. These guys will help with leadership and will allow all misses in close combat to be re-rolled. Now that is a list you can use to win games with. It retains quite a bit of close combat goodness from the Chaplain led crusader squads, the Reiver Squad, and the remaining crusader squad. Then you have plenty of AT fire from the 3 plasmaguns in the crusader squads, 4 twin autocannons from the Ven Dreadnoughts, 3 predator autocannons on the Predators, and then you've got plenty of str 5 weaponry. Lots of duality, lots of killy units, plus we have managed to stay mechanized and balanced. Remember: this list is not perfect, nor should it be considered ultra-competitive. It is a template, but more than that, it was an exercise to try and teach players how to look at their lists and build them properly. Learn to make a truly competitive Black Templars list in BT 101: Building a Competitive 8th Edition List or BT 101: Building Another Competitive 8th Edition List! Finished with the other list exercises? Check out Part Three: Assembling Your Crusade!